Details: My job interview with Geoffrey fell the day after returning from New York Fashion Week where I was freelancing. We were going to meet at the Blue Bottle coffee shop on Beverly Boulevard, which was the perfect location - it was close to home, felt familiar, and I loved it. I didn&apos;t have to think much about what I&apos;d wear - I knew as soon as the interview was scheduled. Black silk track pants (joggers) by Alexander Wang, with a white button-down Rag & Bone shell top, my black tweed Iro jacket, and black pointy-toed pumps. My go-to interview outfit used to be a pencil skirt, but that changed when I found these washed silk joggers that felt cool and different enough to communicate you have style, while staying chic and professional. 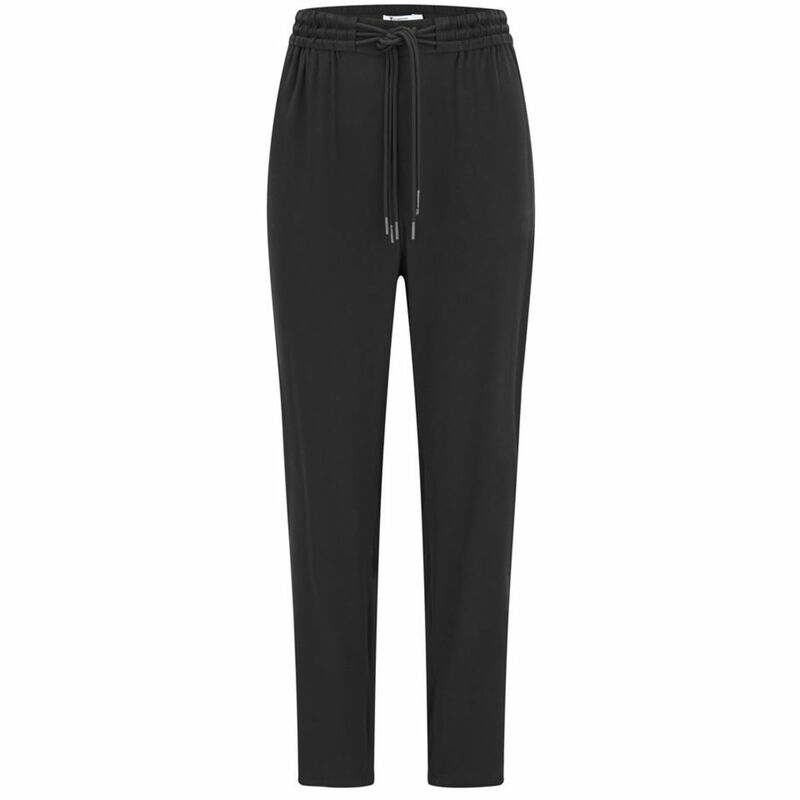 I found them to be the ideal interview pant for a creative job for that very reason: you want to come across as being non-basic and non-boring, while not veering too casual or edgy (of course depending on the company). Their more safe counterpart - a cropped pant or trouser in a stiffer fabric - feels expected, while the pencil skirt is just played out. I love that the pair I wore have an elastic waistband with triple drawstring in the front - it adds a cool athletic detail, but the fact that they&apos;re black and silk makes them dressy. They&apos;re one of the best and smartest purchases I&apos;ve ever made, though at the time, I had buyer&apos;s remorse thinking I&apos;d made a huge mistake buying a pricey silk track pant. They proved me wrong in a very short amount of time by serving the distinct purpose of making you look effortlessly put-together, without the stiffness and structure of a standard black work pant. For my top, I wore a white silk Rag & Bone button-down shell. The jacket covered this detail, but the top of the shoulders have a black color block stripe you can see in the photo above. 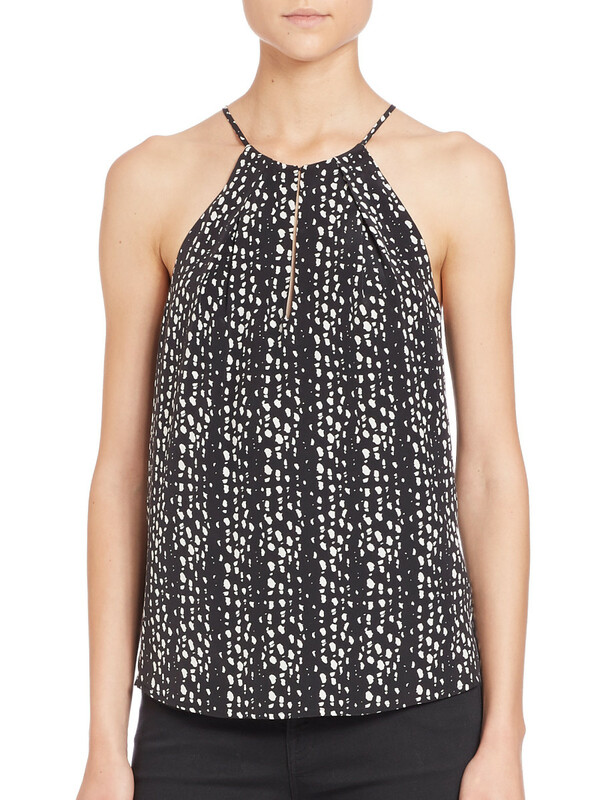 Fun fact: I first saw this top via a Who What Wear story, in which Reese Witherspoon was wearing it. I was instantly attracted to it and strongly considered buying it, but thought $130 was too expensive. *Case in point, you can see the above and below e-commerce images showcase crisp black and white separates styled together - it just wins. I topped the look off with my black tweed Iro jacket, which is actually the single best find and purchase I&apos;ve ever made. I found it at my favorite consignment shop, Ina, in the Nolita neighborhood of NYC. It was $200, my size, and my absolute dream jacket - sophisticated, but with the exact amount of edge I like thanks to exposed silver zippers and hardware. 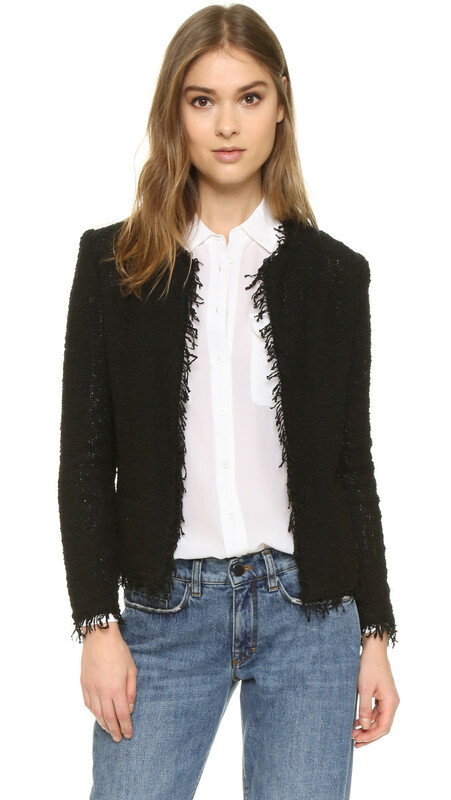 Tweed Iro jackets of this style (they make new versions every season) retail starting at $500, and this one fit like a custom-tailored glove. I still can&apos;t believe I happened upon it. 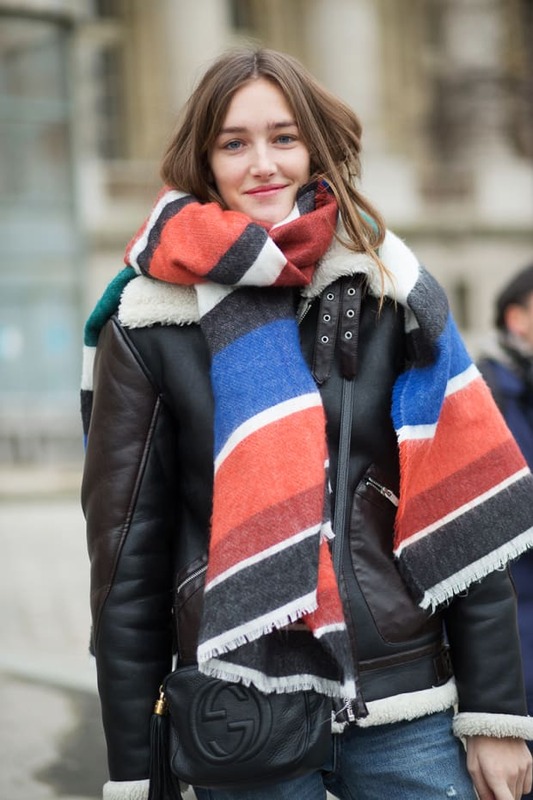 Like the Rag & Bone top at the outlet, it was just fashion fate - right place at the right time. I wear this jacket any time I have a business meeting, interview, or event that requires looking maximally polished. For footwear I wore a simple, classic, black suede pointy-toed pump. I remember the night before the interview texting my friend Kat about my outfit, whose professional and sartorial taste I trust more than anyone. She asked what shoes I was wearing and I told her the only ones I owned that worked were a single-sole black heeled sandal (these Stuart Weitzman Nudists, to be exact) but that I didn&apos;t want to show my toes, so wasn&apos;t sure what to do. She asked if I owned a black pointy-toed pump and I said of course, but that there was no way it went with my black silk track pants. She urged me to try them on and prove it, and sure enough, they worked flawlessly. For some reason, I thought that a sleek black pump and the track pants were too different of aesthetics to go together, but I was wrong. Thank god for friends. They were the perfect shoe for the job. 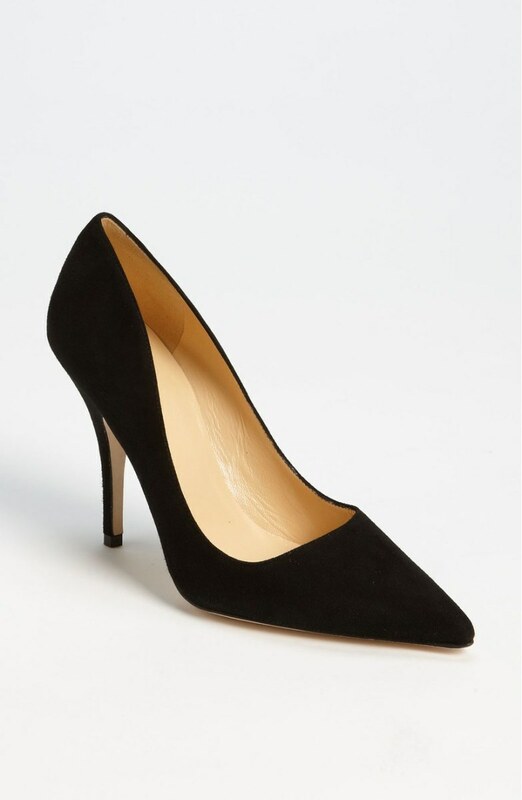 A black pointy-toed pump (in suede, not leather or patent leather) is pretty much always the answer for a job interview. Location: Le Pain Quotidien Larchmont. Details: I remember deliberating hard on what to wear, but I simply wanted to wear the same main pieces because I felt so confident and at ease in them. And they served the purpose I mentioned above - I didn&apos;t want to be another girl in a shift dress. It&apos;s completely true that how you dress both reflects and affects how you feel. For job interviews, I shy away from form-fitting, structured, tight, or overtly feminine pieces. My old go-to, the pencil skirt, kind of hugs at your hips and rides up when you walk and you then have to tug it down. I didn&apos;t want to be adjusting anything, or self conscious about anything. What I like about the silk top + silk pant combo is it&apos;s so breezy. Everything flows - nothing pulls at your body. It&apos;s my power outfit, but I knew I had to at least switch out the top. I remember then thinking to myself - do I run any risk, or harm my chances of getting the job, by wearing basically the exact same thing to my interview with Emily? But I concluded that despite working in fashion and probably being more equipped than the average man to remember outfit details, there was no way Geoffrey would go home and list off my outfit elements to Emily in any kind of identifying way, so I decided to repeat the look (jacket, pants, shoes) with the silk top swap. 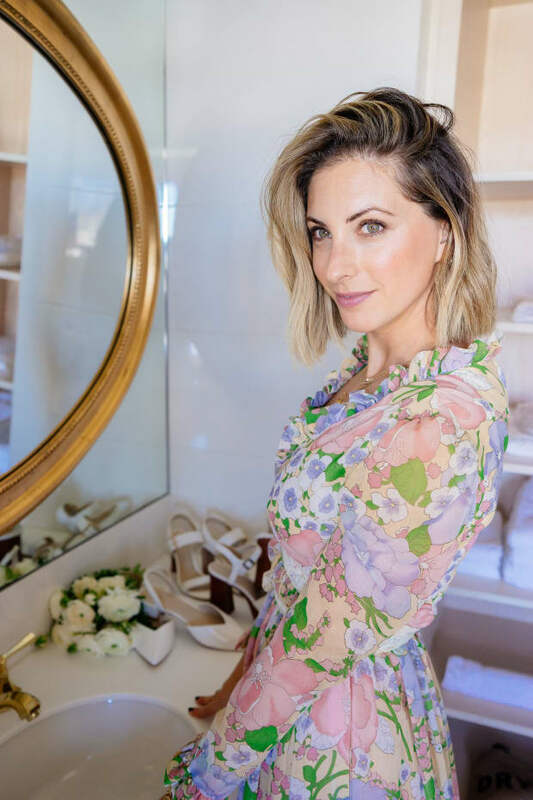 I wore a printed silk Joie top that I&apos;d bought for my first job interview in L.A. (a job I got), so it had good associations and made me feel confident and appropriately dressed. The pattern is like a black-and-white digi print, so it stuck to my color theme, but added a little pizzaz and visual interest. Joie also felt very on-brand for Cupcakes and Cashmere, so I felt all-around good about my look. Ultimately, my decision-making worked in my favor. Emily later told me she observed and loved every detail of my outfit, head to toe, and wondered where I got each piece. (Of course I went through the same thought process for what she was wearing, though recognized her skirt and shoes from the blog, which was exceptionally fun).